For my own entry in the Romantic Comedy Blogathon, hosted by Carole & Co. and myself, I have decided to focus on a lesser-known but undoubtedly very funny comedy by the name of Ever Since Eve, made at Warner Bros. in 1937. This was the second time Marion Davies and Robert Montgomery appeared onscreen together (the first was in Blondie of the Follies five years prior) and this movie also marks the final film appearance of Marion Davies. 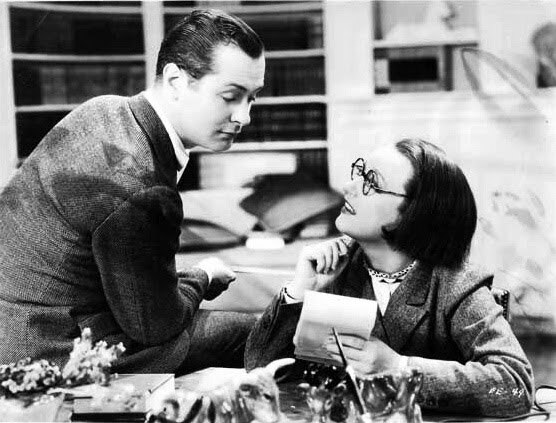 Ever Since Eve tells the story of Marge, a young secretary who, unable to find a job due to her attractiveness, dresses down and immediately finds employment as an assistant to writer Robert Montgomery. But ultimately when he sees, quite by accident, how she really looks, he falls for her and we are treated to a joyous and clever spectacle of mistaken identities for the remainder of the movie, highlighted by Marion Davies’ comedic talent and that of the delightful Patsy Kelly, who plays her roommate. 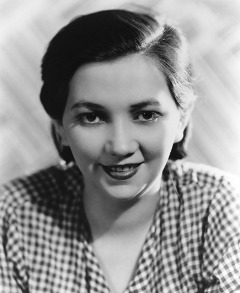 Patsy Kelly, a veteran character actress who often played wisecracking maids or roommates, is a gem. Though she is not referenced often, her face is familiar to the vast majority of people familiar with 1930s Hollywood because of the memorable characters she creates and the boisterous energy she exudes onscreen. Kelly has a penchant for stealing the show in any movie she’s in, and this is no exception. Her smart-aleck line delivery and almost manic characters make for a winning combination, and she has some of the best moments in the movie. Ever Since Eve was her 14th movie, and she continued acting through the 1970s in movies like Merrily We Live, Please Don’t Eat the Daisies, and even appeared in the classic horror film Rosemary’s Baby in 1968. Though by today’s standards the basic plot structure of Ever Since Eve, revolving around physical beauty as a factor in whether or not a woman was hired, might be considered rather misogynistic, it oddly doesn’t seem to matter in this film. The comedy is so sharp and the mistaken identities so expertly crafted that one gets the sense of a Shakespearean comedy of errors. The dialogue is witty and the ensemble work is masterful. Ever Since Eve is a great movie. Despite a widespread publicity campaign, Ever Since Eve didn’t get the attention that Warner Bros. thought it would get upon its initial release. Combined with three prior Marion Davies movies that failed to live up to box office expectations at Warner Bros., this seemed to be the logical end of the line for Marion’s career at the studio. In addition, William Randolph Hearst, companion to Marion Davies and head of Cosmopolitan Productions at Warner Bros., was having severe financial difficulties. Marion thought, for the sake of her beloved “W.R.”, this would be a good time for her leave the movies and act as his full-time companion and caretaker. And that she did, devoting herself to taking care of Hearst, never leaving his side until the day he died. It is said that Marion Davies was one of the kindest, most generous people in all of Hollywood. And this act of sacrificing her film career to take care of her companion confirms it. Marion and Hearst were together for 32 years, until his death in 1951. Ever Since Eve is a true delight. I leave you with a fun scene. This has been an entry in the Romantic Comedy Blogathon. See you next time! This entry was posted in Lara Gabrielle Fowler and tagged blogathon, classic hollywood, ever since eve, marion davies, patsy kelly, robert montgomery, romantic comedy, william randolph hearst. Bookmark the permalink. Looks like a genuine treat. Thanks! And thanks to you and Vince for the blogathon. So many interesting and different takes on the good old romantic-comedy. My pleasure! And yes, if you can find EVER SINCE EVE, it’s definitely worth a watch. I was very pleasantly surprised. It’s not easy to find, unfortunately…like many Davies films, which is tragic because she’s brilliant. The Warner Archive is doing its part to bring her back–several of her movies are available through them. Of the ones that are available through the Warner Archive, I would recommend The Patsy, Show People, and The Red Mill to start with 🙂 And oh boy, Patsy Kelly is a character! I might write a post on her at some point, she was an interesting woman offscreen too. Sure thing! This was a fun blogathon, thanks so much for your post! I agree with you. She could have been one of the great screwball comediennes, had Hearst allowed her to do comedies earlier on. She would have been the prototype for the screwball heroine and not Carole Lombard. Thanks for co-hosting the blogathon! It’s been so fun to read all the entries! Can’t wait to watch Ever Since Eve! Thanks for this wonderful blogathon! I hope I can see Ever since Eve soon, I’ve never seen a Marion Davies’ talk. I think EVER SINCE EVE would be a great one to start with, actually! Maybe it will be released by the Warner Archive at some point. Marion was wonderful in talkies. She had a beautiful speaking voice that was perfect for sound movies, and she adapted quite well. (Belated) thanks for co-hosting this blogathon, it’s been a lot of fun. I’ve been wanting to watch Ever Since Eve for a while, but it’s almost impossible to find it in the UK. Guess I’ll just have to console myself with some of Marion’s other classics (Show People is a personal fave) until it’s more widely available!